On Saturday 24th, reproted here on the evening of 19th. 23 on guard. 25th detailed in the mustering out office as Clerk 27 wrote to Story. 29th heard Louis preach for the second time. 30 wrot to C A K, 31 wrote home Lewis Fricke No. 402 Gaunt Street between Cutter & Cossuth. 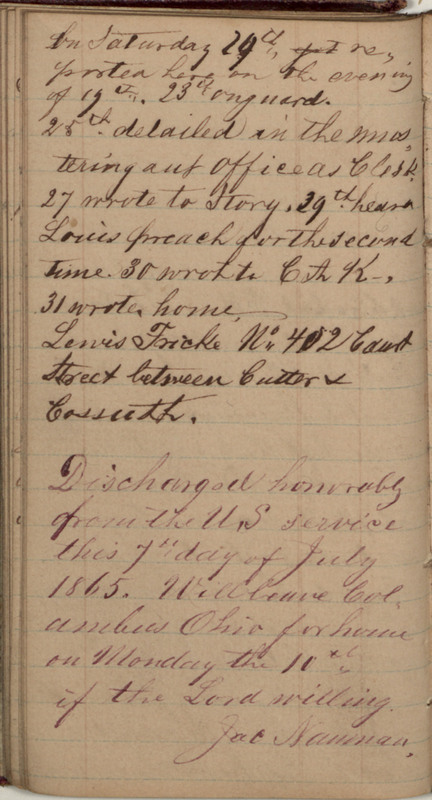 Discharged honorably from the U.S service this 7th day of July 1865. Will leave Columbus Ohio for home on Monday the 10th if the Lord willing. Jac Nauman.